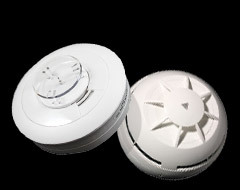 Fire safety products in London & Kent | CTA Fire | Smoke alarms and detectors. Our range of fire alarms, smoke detectors and ancillary devices are manufactured by Argus Security and Aico. Together, each of these devices can be wired or wirelessly networked to a digital control panel that protects every corner of your premises, no matter how many storeys or how complex the layout. 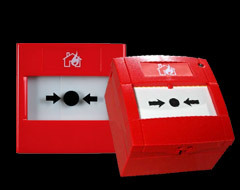 Our fire safety devices include: manual call points for triggering the alarm system, smoke detectors with high sensitivity, heat detectors designed to trigger at certain temperatures or rise in range of temperatures, plus combination beacons and sounders with a variety of visual and audio outputs. Our smoke detectors are fully intelligent and both transmit and receive wireless signals as part of your larger fire saftey network. LED flash and beep patterns communicate the status of the device (including fault and tamper states) and long battery life plus built in dust traps ensure uninterrupted operation. These are highly reliable devices and include 'test' buttons for peace of mind. Designed to detect either a fixed temperature or a rise in temperature, our heat detectors can alert you earier to a source of fire. They're suitable in environements where smoke alarms are not, for instance, in kitchens where harmless smoke may be present. 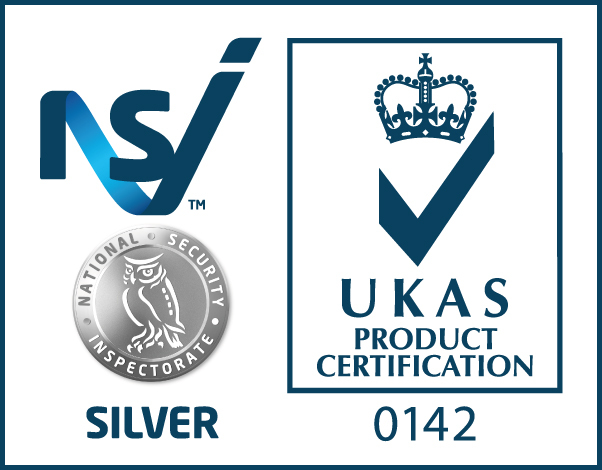 Our heat detectors are fully intelligent and both transmit and receive wireless signals as part of your larger fire saftey network, allowing you to address them remotely. They also come in a range of finishes to match your decor. 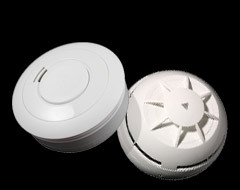 Our cost effective audio-visual solution to fire detection alerts is our range of wall sounders and beacons. Completely wireless, these devices benefit from a long battery life and a highly reliable bi-communicational signal connecting them to the rest of your network. The sounders offer three selectable audio tones and a custom volume control. Our base sounders and beacons are audio-visual alert devices that plug into, and draw power from, our Vega line heat and smoke detectors to form all-in-one units. They offer wide-angle and uniform sound distribution of 32 selectable tones, providing good audibility in all directions. A simple but crucial addition to a fire safety network, our wireless call points allow the public on your premises to signal a fire by pressing the glass-free sensor. Each call point can be manually reset by key once triggered, denoted by a signal flag and alert LED. You can manage absolutely every device in your fire safety network via the Mx-4200 control panel. It's proven around the world and has been used extensively in fire detection applications for a number of years. The user-friendly keypad input and LCD menu system allows you to control either one or two networks simultaneously, finding the source of faults, monitoring battery life of your devices and running diagnostics. You can even operate the panel from one of the extensive suite of PC based programs developed specifically for this model. Wireless translators are fully intelligent radio field devices offering bi-directional communication to boost capability in building a full addressable fire alarm system. With a high noise immunity and intelligence to resolve to clear frequencies, our translators can expand the size of your networked system more cost effectively. SG100 Wireless Smoke Detector - fully compliant with both BS 5839 and EN54 standards. Automatic wireless channel hopping to prevent communication failure, with a wireless range of 600m. Powered by primary (5 year) and secondary (2 month) low cost lithium battery technology, which can be monitored via the control panel. 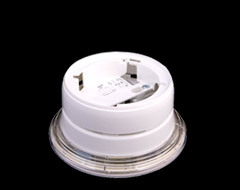 Ei605TYWRF Optical Smoke Detector - fully compliant with both BS 5839 and EN54 standards. RadioLINK "House Coding" prevents cross communication with other nearby RadioLINK systems. "Hush" causes a 10 minute period of reduced sensitivity to overcome false alarm conditions. Insect resistant fine mesh screen protects the optical sensor. Wireless range of 30m. Up to 12 units can communicate on one system. Automatic self-test every 40 seconds. Remote control testing also available. 10 year lithium battery. 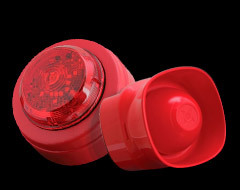 Ei603TYCRF Heat Alarm - fully compliant with both BS 5839 and EN54 standards. 10 year lithium battery. 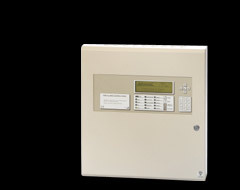 Alarm triggered when the temperature at the unit reaches 58°ree;C. Up to 12 units can communicate on one system. Wireless range of 30m. RadioLINK "House Coding" prevents cross communication with other nearby RadioLINK systems. Wireless range of 30m. Automatic self-test every 40 seconds. Remote control testing also available. V100 Intelligent Optical Detector - fully compliant with both BS 5839 and EN54 standards. Designed to withstand light and heat from external light sources. Decorline finishes available. Up to 240 devices per loop. Short circuit isolators in each device. 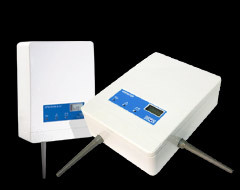 SGRS100 Wireless Wall Sounder - fully compliant with EN54 standards. Automatic wireless channel hopping to prevent communication failure, with a wireless range of 600m. SGRS100 Wireless Wall Sounder - fully compliant with EN54 standards. Up to 240 devices per loop. Short circuit isolators in each device. Auto addressing capability. SGCP100 Wireless Resettable Call Point - fully compliant with EN54 standards. Automatic wireless channel hopping to prevent communication failure, with a wireless range of 600m. Powered by primary (5 year) and secondary (2 month) low cost lithium battery technology. Ei407 Manual Call Point - fully compliant with EN54 standards. RadioLINK "House Coding" prevents cross communication with other nearby RadioLINK systems. Powered by 10 year tamper-proof lithium battery. Up to 12 units can communicate on one system. Mx4200 Advanced Control Panels - fully compliant with EN54, parts 2 and 4 for use with Argus Vega devices. Interfaces with purpose-built Windows software via direct PC or modem connection. Full support of Apollo (Discovery, Xplorer S90 & Xp95). Hochiki ESP, Nittan Evolution and AV protocol. Installer friendly 'Auto-learn' and 'Loop Detection' facility for troublefree, commissioning. Copious language support. Digital logo upload and display feature. VW2W100 Translator Module - orthogonal antennas guaranteeing reliable and secure communication across 7 channels. Immediate signal trasnmission in the event of alarm, fault and tamper. Wireless range of 600m, increases to 1000m when integrated with SGWE expander. Interfaces with purpose-built Windows software via direct PC or modem connection. Up to 32 units can connect to a single translator.